Phi Beta Iota: We reported this earlier. See Journal: UN IPCC, Al Gore, & Big Doubts and in book reviews Science & Politics of Science (18). See alsoEnvironment (Problems) (50) and Environment (Solutions) (69) as well as True Cost & Toxicity (21) and Misinformation & Propaganda (85), Nature, Diet, Memetics, Design (57, and Truth & Reconciliation (38), United Nations & NGOs (31, and Values, Ethics, Sustainable Evolution (128. 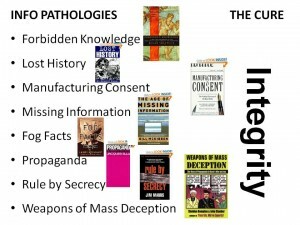 Forms of data pathology are illustrated below. The REASON that intelligence professionals and philosophers MUST demand “the truth at all costs” is because in doing so, all other costs are lowered.